Fast & Free Standard Shipping on All Orders. New ankle cuff & stirrup design for advanced protection. The ASO EVO Ankle Brace is an evolutionary advance in ankle protection and performance. The ASO EVO features a new dynamic, flexible ankle cuff woven inside the nylon boot, along with stirrup straps originating from inside the brace to provide greater ankle protection. The dynamic cuff and new stabilizing strap design provides enhanced resistance to inversion - eversion and more stability towards high ankle sprains. 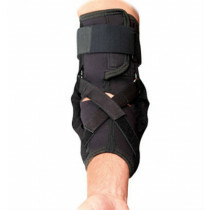 The rest of the brace is exactly the same as the original ASO for a brace that is both comfortable and effective for preventing and treating ankle sprains. The ASO EVO ankle stabilizer does not have any extra bulk or application complexity compared to the standard model. New plastic cuff imbedded inside for greater dynamic ankle support. Stirrup straps exit through the outside of the plastic cuff to make their figure-8 pathway. Ballistic nylon construction throughout for durability. Padded SkinLoc tongue and heel for supreme comfort. New design provides greater protection for ankle sprains and syndesmotic sprains. Made in the USA for excellent quality control. Machine wash cold; Air dry for best results. Treatment and prevention of ankle sprains. Highly recommended for athletic ankle sprain prevention. High ankle sprains (syndesmotic sprain). 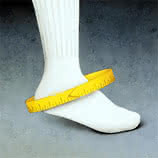 Measure the ankle circumference around the heel or use the shoe size method. Use circumference measurement or shoe size charts below to order. ASO EVO ankle stabilizer is made out of baby ballistic nylon material for durability. 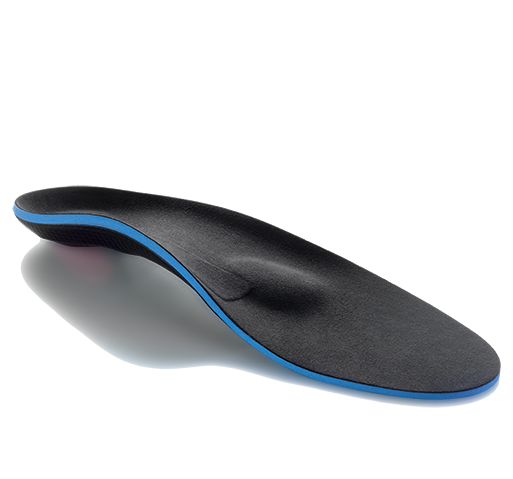 SkinLoc material provides padded, breathable comfort in the tongue and achilles areas. I was in a car accident about 8 years ago and had a severe ankle injury. This brace helps stabilize my ankle which doesn't bend. It helps alleviate pain. 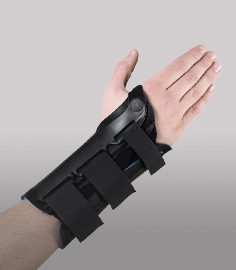 I looked around quite a bit online and in stores and numerous people suggested this brace. I got it within like 2 days of ordering it, tried it a couple days later and it was like I wasnt even wearing it. There was the support that I needed but other than making my shoe a little wider, I couldnt even tell it was there. So far I am extremely impressed with this and hope it helps others. I bought this model based on the knowledge of the support person in chat and their ability to compare the pros/cons of the different options - fits snugly and provides excellent support. Used these braces for several years and they are awesome...Just getting a new pair to replace my worn out ones from a couple of years ago. They get used hard and they provide excellent support! We love basketball! From my husband who (still @ age 57) plays 3-4 times weekly, to our four sons and four daughters who have all played on school teams. But protecting our ankles is a challenge.  We have used the ASO ankle braces from DME for 15 years or more. They are the best and truly help avoid injury. Been using for 15 yrs since college - just bought my son a pair as well.